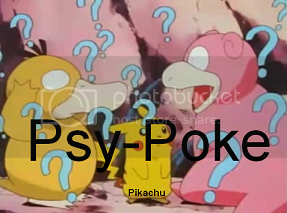 Psypoke - View topic - Mysterious Island! No more People! Mysterious Island! No more People! Location: wherever there is MANGA! as cacnea ran off togepi cried "wait!!!" and ran off after him. he yelled back at the shuppet "follow me!" he ran and ran and ran and then heard "help!" togepi ran towards the direction of the sound and found cacnea, stranded on top of a gigantic rock. togepi used metronome, hoping to use fly or wing attack or something. togepi teleported up to cacnea. togepi grabbed cacnea and jumped onto the water and waterslided down. "are you all right?" toepi asked. I have a DS! Again! lost it, bought a new one! I can't visit as often. Maybe I'm on my DS. Or playing Super Brothers Smash Brawl. Or doing theater. Ya. Shuppet dicided that he should go somewhere else, so he flew towards a rock and went around it, and then he saw togepi and cacnea again. "AHH! Wha-wha are you doing here?!" said Shuppet, forgetting that it was him that found them, not them. "If you don't go away, I'll...I'll put a curse on you!" continued Shuppet. After using psychic Ralts went running away in hope that the Gliflar wouldn't follow him. "OK, it's gone, but what am I suposed to do now?" Questionned Ralts to himself. "Maybe I'll train so I can become a Gallade, but I would need a Dawn stone, plus I'd have to go through being a Kirlia,; the balarena-ish pokemon and I'm a boy." Ralts had puzzled himself so mucj he decided to enter a small cave near the edge of a cliff and think it over. Once he entered he was horified to see that the cave was occupied; by a Rhyperior! edit: I'm back!!!!!!!!! whoa. no one has posted since i've been gone?! scary. "whoa whoa whoa, settle down shuppet I don't want to hurt you. i want to be your freind." I also can't use the computer often anymore. I'm back! Re: Mysterious Island! No more People! How you got on the island: on the back of a flygon, it dumped her off on the island. I did necromancy. (I had no idea what it was.) Sorry, Cruncky. Please do not necromance no more. It breaks Crunchy's heart. Love, your dear friend Crunchy.